A group of Burmese journalists said they would begin wearing black T-shirts on Saturday in protest at the detention of two Reuters reporters accused of violating the country’s Official Secrets Act, as pressure builds on Burma to release the pair. A coalition of a dozen Burmese media advocacy groups has come to the defence of two local Reuters journalists arrested Tuesday in Yangon, calling on the government to respect their right to gather information and urging that they be released from custody. Two Burmese reporters for the Reuters news bureau in Yangon were detained on Tuesday evening in the commercial capital’s northern suburbs. Three journalists, two of them foreigners, and their driver attended a fourth court hearing on Monday in relation to a drone that prosecutors say was flown illegally near Parliament last month, with the non-Burmese duo hit with an additional charge. Four people, foreign journalists among them, have been sentenced to two months’ prison time for attempting to fly a drone in the capital. Turkey’s state broadcaster said a team of journalists filming a documentary in Burma had told the government of their plans before they were detained for attempting to fly a drone near the country’s parliamentary complex. Burmese police said on Saturday they were preparing to charge journalists working for Turkey’s state broadcaster TRT, their local interpreter and driver for bringing a drone into the country without permission. Burmese police detained two journalists working for Turkey’s state broadcaster TRT and their interpreter and driver on Friday for flying a drone near the Parliament compound, amid tension between the two countries over the Rohingya crisis. Bangladesh allowed two journalists from Burma detained while reporting about fleeing Rohingya Muslims to fly home on Tuesday and was dropping charges against them, their lawyer said. The trio – DVB’s Aye Nai and Pyae Phone Aung, and The Irrawaddy’s Lawi Weng – were arrested at a checkpoint while returning from TNLA territory. Mae Tao Clinic receives about 200-300 outpatients every day, and 80 percent of its 140 beds for inpatients are occupied on a daily basis. The decision marks the end of a four-month ordeal that began when The Voice Daily duo were arrested for a satirical column lampooning Burma’s military. Two journalists from Burma, who had been detained in Bangladesh while reporting on the influx of thousands of Rohingya Muslims, have been released on bail, a police official said on Saturday. 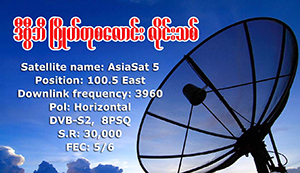 The five winners of licences awarded by the Ministry of Information to air their content in a landmark public-private broadcasting partnership, a roster that includes DVB, will sign official agreements with state-owned Myanmar Radio and Television in early October. A lawyer for two Burmese journalists detained in Bangladesh while reporting on the influx of thousands of Rohingya Muslims from Burma said on Monday he had been denied access to them amid concern over their well-being. The formal withdrawal of charges in the high-profile “unlawful association” case involving three journalists and three others in Shan State’s Hsipaw Township was postponed on Monday, with the legal bureaucracy delaying their official exoneration for another several days. In a surprise Friday announcement, the Tatmadaw said that it will be dropping charges it had brought against six journalists, including a high-profile “unlawful association” case it had brought against two reporters from DVB and one from The Irrawaddy news outlet. But for many civil rights activists who had called for parliament to repeal the Telecommunications Act, lawmakers have failed to tackle the issue. The Myanmar Press Council has sent a letter to Rangoon Chief Minister Phyo Min Thein in response to a complaint he filed over a Reuters article published earlier this month that scrutinised his handling of a major bus purchase by the regional government he leads. A senior NLD party member said a majority of parliamentarians liked the protection against online criticism the law provided. Bail was denied for a second time on Friday at the fourth hearing in the case of three journalists and three other defendants facing charges at a court in Shan State under Burma’s Unlawful Associations Act. The third hearing in the case of a trio of detained journalists and three civilians on charges of “unlawful association” was held on Friday, with two of the prosecution’s witnesses failing to appear before the court despite being scheduled to do so.